The Penedès Varietal Trifecta: Xarel·lo, Macabeo and Parellada, the Perfect Mouthful! When I first moved from California to Penedès I was struck by how much it looks like Napa Valley. It’s to the point where, in the back of my mind, I expect an earthquake to happen at any time! My Catalan friends are trying to convince me to relax, no earthquakes here, but I’m not so sure…. But what they do have here, that’s unique in the world of wine, is what I call the holy trinity of white grape varietals, Xerello, Macabeo and Parellada, that is to Cava what Chardonnay, Pinot Noir and Pinot Meunier is to champagne. The three latter varietals are, of course, the only kind of grapes allowed when making the sparkling wine from the Champagne region, located only about an hour away from Paris, thus one of the northernmost wine regions in the world. 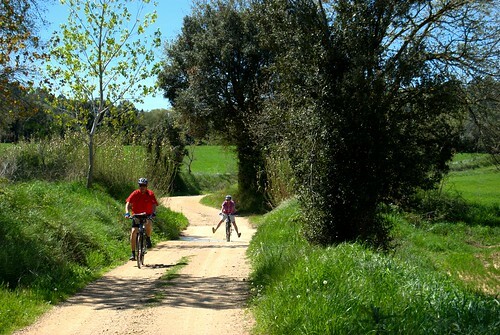 Penedès is located much more further south, just half an hour southwest of Barcelona. Although other grapes are allowed in the production of Cava, such as Pinot Noir and Chardonnay, these three, Xarel·lo, Macabeo and Parellada, are the ones that represent the Penedès terroir better than any other and make some fantastic sparkling wines. Macabeo – sometimes known as Viura in other parts of Spain – gives Cava it’s freshness and body, Xarel·lo – acidity and structure- and Parellada – softness and elegance- are, as far as varietals go, distinctly different but particularly good together. Some of the best Cavas, which are made in the traditional method the same way as champagne, are very different than their northern sister sparklers but equally superb and incredibly price worthy! Augusti Torello’ ; especially Kripta, one of the best Cavas I’ve had, it comes in a bottle shaped like an amphora, which means you can’t put it down, and you don’t want to, believe me! If you can’t find these fabulous Cavas where you live, come here to Penedès and try them, and many, many more! Tagged with cava Xarel·lo, Macabeo, Parellada, Penedes. Hello all winos, welcome to Barcelona Wine! Being what some consider a ‘wine expert’ I’m often asked which is my favorite wine? Since wine is like music to me, I like any wine that’s good, be it a Sancerre (Sauvignon Blanc) from the Loire Valley, a Zinfandel from California or a great Cava from Penedès. So my answer is that I don’t have a particular one that is my favorite but I can for sure say which wine changed my life, the one that made wine my passion; an Alban vineyard Viognier from Central Coast, California. After the first sip of that Viognier (which is a white Rhone varietal) it was as if something in my brain adjusted and fell into place. Was I hard wired (hard wine-d?) for this? That I don’t know, but since then I have devoured everything on the subject of wine I can get my hands on, and in the meantime became a partner in a winery, started a wine school and a wine tour business. Last year I started up a wine oriented Bed&Breakfast, Ca Solyerik, in Penedès, just 35 minutes from Barcelona, where I arrange courses, classes and tastings. What I have learned in the last 10-12 years is that nobody can ever know everything about wine. That’s what makes it so exciting, there is always something new to discover! And I’m equally excited to bring you along- virtually or in person- on my wine adventures here in Catalunya wine country! Tagged with Alban, Penedes, Priorat, viognier, wine, zinfandel. Priorat – wild and wonderful! I had no idea what to expect when we went to Priorat last week. Driving south on the autopista from Penedès, we just followed the main route along the Catalonian beach resorts, and there was no indication that we were about to enter one of the new cult regions in the world of wine. Exiting the Reus off ramp we promptly ended up on winding roads that led us to the spectacular mountains of Priorat, and a string of isolated villages with names like Gratallops which, according to my travel companion Marina, means something like ‘scratching wolves’ . Fortunately we didn’t see any of those, but the sight of the vineyards, clinging up slopes that are almost perpendicular, took my breath away, and it was easy to understand that the only ‘vehicle’ being used on these slopes during harvest time is the ‘burro’, the trusty old donkey. The soil is incredibly poor, it’s almost a joke to call it soil, since it seems to consist mostly of crunched and pulverized stone. Many believe the secret to Priorat’s success lies in its amazing, granite-like soils, known to the Catalan people as llicorella and to the rest of Spain as pizarra. The llicorella soil resembles slate or shale rock, intertwined with tiny bands of reddish-brown earth. The name llicorella stems from the Catalan word for licorice, descriptive of the sometimes black, shiny rocky substrate with a high mineral content. On the one hand, easy to break apart, on the other virtually indestructible, it forces the roots of vines to dig very deep in search of water. So much the better for the vines that must strain to produce grapes, which will increase the quality of the subsequent wine. On average, one vine produces between half to one bottle of magnificent wine. The relatively high price of Priorat wine is thus understandable. The Priorat as a wine region was almost wiped out because of a Phylloxera infestation, but, like the soil, the vintners of Priorat is a hardy bunch, and banded together to unite their resources. It has truly payed dividends and today, wines from this spectacular place are highly praised – and priced! 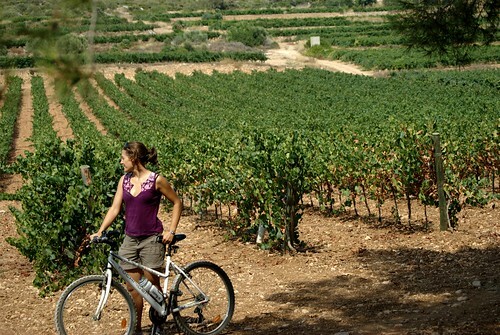 Next time; Winetasting, adventures and fun in Priorat! Tagged with Garnacha, Macabeo, Priorat, wine. The wine is from the Penedès region, west and slightly south of Barcelona, where Parés Baltà has grown grapes for more than two centuries. Clearly, though, the composition of this Rosado, from international grapes like syrah, merlot and cabernet sauvignon, comes from a relatively recent planting. As with many of these rosados, this one had a touch of residual sugar, but the sweetness was so well balanced by the acidity that the overall effect was greatly refreshing. Snappy and refreshing with an aroma of strawberries and stony mineral flavors. Our No. 1 bottle, in fact, the snappy, refreshing 2010 Ros de Pacs from Parés Baltà, was also our best value at the exceptionally low price of $11. This, my friends, is a good deal. Tagged with Penedes, price, rosé, wine, winners. There is something very exciting about being a part of this new wine blog, Barcelona Wine, a little bit like the first day of school, or maybe moving to a new home, which is just what I did seven months ago. After 24 years in the US, I decided is was time to move back to Europe, but having lived in Southern California I had become a climate princess, and with wine being my work and passion, my native Sweden was out of the question. After two years of research for a new place to call home- the criteria being an interesting wine region with a similar climate to California, close to a major city in either Italy, France, Portugal or Spain – I decided to move to Penedès. Pene-what, you say??? So did I, and most of my friends in the wine business. How come this spectacular and mega producing wine region has stayed so anonymous in the world of wine? And consider this; we’re only some 35 km southwest of Barcelona! Who knew??? I sure didn’t! But that’s where I ended up, and I am looking forward to tell you all about the Secret Life of Penedès in the months to come! Tagged with Barcelona, cava, Helena, moving to Penedes, Penedes, wine. The other day a group of 6 Swedes from the very north of Sweden (think midnight sun, reindeers and snow) joined me for a nice day in Penedès and Montserrat. We started from their hotel in Barcelona and had a nice drive through Penedès before reaching one of my favourite cava makers – Cavas Nadal. 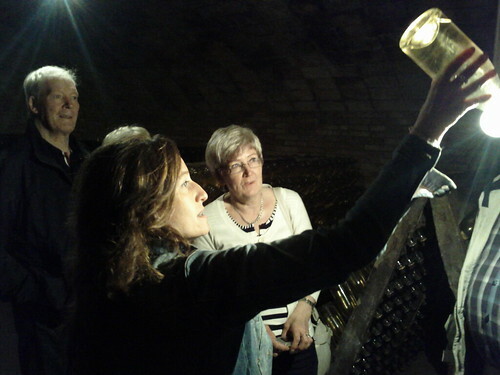 There our friend Núria guided us through the cava making process, here showing us the fantastic RNG Gran Reserva, before we started the tasting. We then continued up to Montserrat for a quick visit of the monestary before eating an amazing catalan lunch at Vinya Nova. It is really fun to have the chance to explain more about the wine country, about living here and about everything we see around us all day. Having guided mostly Swedish maybe you’d find it interesting to know that building standards is a favourite topic to talk about during our tours. In short – a great day! Tagged with bodega, cava, guest, montserrat, photo, svenska, swedish. After some months of work, and years of experience, we are now ready to open up barcelona-wine.com to the public! We hope that Barcelona Wine will be your one-stop site to look when….